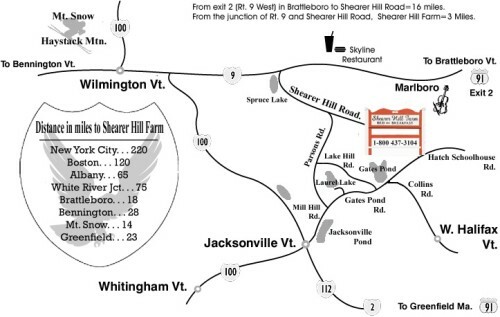 Shearer Hill Farm is located 5 miles off Rt. 9 on Shearer Hill Road between Brattleboro and Wilmington, Vermont, just 10 minutes from downtown Wilmington and 20 minutes from Mount Snow Ski Resort. For detailed directions see below, or please give us a call. Take I-95 or Merrit Parkway in CT to I-91N. Continue on I-91N into Vermont. You'll pass the Welcome Center about 15 miles into Vermont. You might want to stop in, as it's a wonderfully down postbeam barn. Shortly after the Welcome Center take Exit 2 (Wilmington Rt 9 West). Shearer Hill Road is "exactly" 16 miles on the left. The center of Wilmington is exactly 18 miles from I-91. Shearer Hill Road is a dirt road. Go in 1.5 miles and take the left fork (Shearer Hill Road) and then travel exactly 1.5 miles further and we are the Large Putty colored farm house is on the right. There is a sign and it is lite at night... The sign reads, "Shearer Hill Farm Bed and Breakfast"
Take I-91S to Exit 2 (Wilmington Rt 9 West) in Brattleboro, VT. At the end of the ramp take a right onto Route 9W towards Wilmington and Bennington. Shearer Hill Road is "exactly" 16 miles on the left. The center of Wilmington is exactly 18 miles from I-91. Shearer Hill Road is a dirt road. Go in 1.5 miles and take the left fork (Shearer Hill Road) and then travel exactly 1.5 miles further and we are the Large Putty colored farm house is on the right. There is a sign and it is lite at night... The sign reads, "Shearer Hill Farm Bed and Breakfast"
Follow Route 9 from Keene NH to Brattleboro, VT. After you cross into Vermont you'll continue straight through the rotary and get onto I-91S. Take I-91S to Exit 2 (Wilmington Rt 9 West) in Brattleboro, VT. Shearer Hill Road is "exactly" 16 miles on the left. The center of Wilmington is exactly 18 miles from I-91. Shearer Hill Road is a dirt road. Go in 1.5 miles and take the left fork (Shearer Hill Road) and then travel exactly 1.5 miles further and we are the Large Putty colored farm house is on the right. There is a sign and it is lite at night... The sign reads, "Shearer Hill Farm Bed and Breakfast"
Follow Route 7 from Troy NY to Bennington, VT. Follow Route 9 from Bennington, VT to Wilmington, VT. Continue on Route 9 through Wilmington toward Brattleboro, VT. The road does fork just ourside Wilmington, stay left. Look for Shearer Hill Rd. sign on your right - it's about 2 miles outside Wilmington. Turn right onto Shearer Hill Roud. Shearer Hill Road is a dirt road. Go in 1.5 miles and take the left fork (Shearer Hill Road) and then travel exactly 1.5 miles further and we are the Large Putty colored farm house is on the right. There is a sign and it is lite at night... The sign reads, "Shearer Hill Farm Bed and Breakfast"
One of the things that customers tell us often is that after they find the B&B, they found the scenic drive very enjoyable. 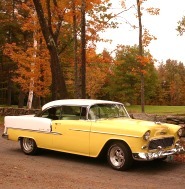 We are located a bit "off-the-beaten-path", but if you should get lost, just give us a call. We always keep a phone handy when we're expecting guests. The drive from Rt. 9 to our door is beautiful during the fall, and if you're lucky, during the winter they'll be a fresh fallen snow.